Posted on Mon, Jul 23, 2012 : 12:57 p.m.
Michigan athletic director David Brandon talks on the radio at the M-Den during the WTKA Mott Takeover fundraising event in May. 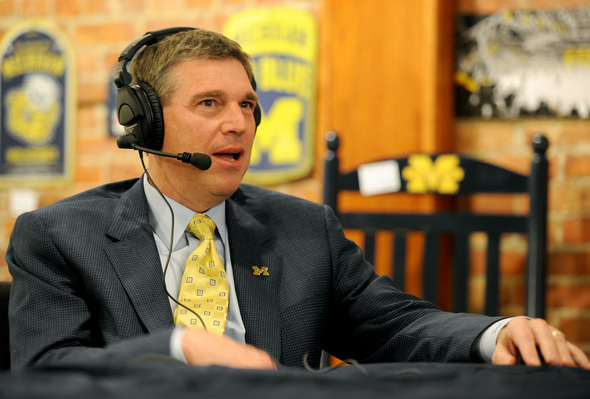 Two years after his start at the University of Michigan, administrators are pleased with athletic director Dave Brandon's performance. So pleased, in fact, that the school has extended his contract three years before it's set to expire and increased his pay rate to a possible $1.5 million in 2017-18, up significantly from his current earnings. Brandon's 2011 base pay rate was $600,000 and he received $165,000 in bonus pay outlined in his contract and $100,000 in deferred compensation. Under the extension, Brandon will earn $800,000 in base pay this year and his base will rise $50,000 each year afterward — eventually reaching $1.05 million in 2017-18. 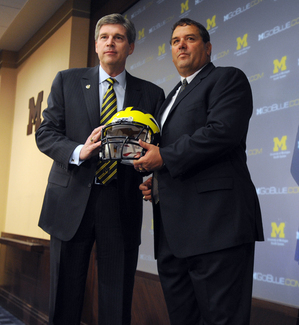 Dave Brandon shortly after he announced the hiring of Brady Hoke in 2011. Further, the amendment increases possible bonus pay to $200,000 each year, up from the $165,000 currently allotted. Brandon also is entitled to yearly deferred compensation credits, which will rise from $100,000 this year to $200,000 in 2016 and $250,000 in 2018, according to his contract amendment, which was approved by regents last week. Brandon has guaranteed sports tickets, the use of two cars and free use of the university's golf courses. Some travel for his wife, Jan, also is reimbursed, according to his employment contract. The pay increases secure Brandon's spot among the highest paid athletic directors in the nation. A 2011 USA Today database listed Brandon as the third-highest paid athletic director in the Big Ten, behind the athletic directors of Ohio State and the University of Wisconsin, who earn $1.058 and $1.041 million a year, respectively. Among the highest-paid officials were the athletic directors of Vanderbilt University and the University of Texas, with salaries ranging from $2.56 million to $1.096 million. Brandon, a Michigan alumnus, former Wolverine football player and former U-M regent, left his job as Ann Arbor-based Domino's Pizza's chief executive officer in 2010 to become Michigan's athletic director. As Domino's chief executive, Brandon made $3.2 million in 2008. Former U-M athletic director Bill Martin earned a base salary of $380,000 when he left in March 2010. Since coming to U-M, Brandon has overhauled the athletic department internally, overseeing the exit of 85 staff and the hiring more than 100 new employees — including creating 30 new positions. As chief marketing director, Hunter Lochman sits in one of those new positions and is overseeing another one of Brandon's new initiatives, the launch of a student loyalty program. 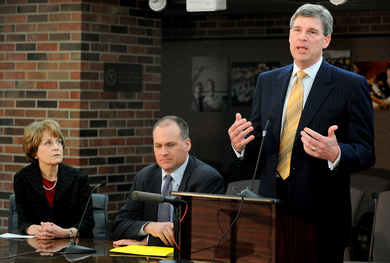 U-M President Mary Sue Coleman and former football coach Rich Rodriguez listen in November, 2010, as Dave Brandon explains NCAA allegations to the press. Rodriguez was fired months afterward. Brandon also is responsible for hiring football coach Brady Hoke and firing football coach Rich Rodriguez. Brandon OK'd the first ever night football game at Michigan Stadium last year, which Michigan won in the final seconds against Notre Dame before a record-setting crowd. He began a series of stunts and "wow factors" last season, too, including "Rocket Man" delivering the game ball, a pre-game "card trick" and adopting throwback jerseys. Most recently, Brandon announced that Michigan Stadium will receive a $2.8 million marquee and a $6 million paint job. Last year, football, basketball and hockey received $20 million scoreboards. He has announced plans for $250 million in construction projects for non-revenue projects in the coming years. "We've gone through a period of change that certainly results in a completely different organizational structure. We are much stronger," Brandon said in June. In a memo to regents, U-M President Mary Sue Coleman praised Brandon's performance. "He has done an outstanding job of leading Michigan's intercollegiate athletics in a highly competitive landscape," Coleman wrote, lauding his "compelling strategic vision for the development of Michigan athletics." Wed, Jul 25, 2012 : 12:40 a.m.
Just getting rid of Rodriguez was worth every penny of that and more, not to mention how much he has done to restore Uof M to greatness!! Tue, Jul 24, 2012 : 1:15 p.m. Wed, Jul 25, 2012 : 5:57 p.m. This guy should not make more than 100K per year. Take that money, reduce tuition costs and make this overinflated school more affordable. It has become nothing more than a school for rich kids and foreigners. Taking Hoke off the training table would probably save each student at least 5k per year. Tue, Jul 24, 2012 : 4:07 p.m. The last two years of going to Michigan games has become an adventure in mimicking pro basketball and pro football. We now have super video boards, marginalization of the Marching Band and non stop &quot;speaker noise&quot; between every break ... and another giant marquee adding to the &quot;experience&quot; ( is this the &quot;new halo&quot; ;=]) As others have noted when it becomes money money money above all else the values of the system will be lost. Other &quot;financial driven bubbles&quot; always have disastrous ends. One hopes this current &quot;bubble&quot; can be brought under control before ... Michigan athletics WAS about college sports with traditions and the excitement of the game at the amateur level. It needs to return to that model. Tue, Jul 24, 2012 : 2:51 p.m. I don't begrudge Brandon getting what salary he can get, or doing what he thinks is right (even if I disagree with his plan on a lot of the promotional &quot;disneyification&quot; part). I do raise the alarm that at our university, where he has such close embedded ties on a variety of levels, he is nearly impossible to supervise and check his power. I have repeatedly raised the question of, &quot;who CAN check his power, when those in the position to do so are his former co-Regents and the President to whom he had supervisory control over and has given millions to?&quot;. Though his heart and love is clearly with and for UM, the whole power structure is of great concern to me, especially when we see how it can be abused. Who at the university will effectively be able to say &quot;No&quot; or &quot;enough&quot; to him? I doubt that there is anyone. And that is a problem. Tue, Jul 24, 2012 : 2:13 p.m. He has offended many, many alumni with his offensive approach auctioning off athletic seats to the highest athletic donor, while ignoring other's ties to the University. Essentially, he is running the athletic department as if it is a private atheletic team and ignoring the University....Obviously the message from Happy Valley about running an athletic program like a business has not been received in Ann Arbor, and the timing of the announcement of his raise could not have been more tasteless. This guy creates a toxic business approach to athletics, and if you are shocked by the posts you need to get out of your closed circle a bit more. For an AD who magically cleaned up the mess in the football program, it is remarkable how he has managed to alienate so many fans of the University with his tasteless dollar value approach to individuals..when he leaves the University it will be good ridance! Tue, Jul 24, 2012 : 1:08 p.m.
Brandon makes more in just one year than what most people make in a lifetime! There are probably 10,000 highly qualified college educated and experienced business people within a sixty mile radius of the Ann Arbor campus that would jump at the opportunity to do the job for $70,000 to $80,000. No one can work hard enough or long enough to earn a million dollars in one year. Tue, Jul 24, 2012 : 9:02 a.m.
Tue, Jul 24, 2012 : 12:40 p.m.
Looks like you're the one doing the whining, Insider. Tue, Jul 24, 2012 : 12:22 p.m.
What's your point? The vast majority are Professors at a Major Research institution, which is could be described as the UM's core function - NOT FOOTBALL. One of these may make significant contributions to society, and Dave sold crappy pizza and now Sky boxes for which none of the little people will ever see. I think most would disagree but it is exactly why Penn State happened - MONEY, MONEY, MONEY! Penn State was fined less than 50% of ONE years &quot;take&quot;. Oh the pain. No new neon sign for Penn State this year. Tue, Jul 24, 2012 : 5:31 a.m.
Brandon is doing a high profile job at a high profile institution...and he's doing a damn good job, imo. He hired Brady Hoke and his great staff, for goodness sakes! It seems some people just live to complain. Keep it up Dave! Tue, Jul 24, 2012 : 12:39 p.m.
Did it occur to anyone that Brady Hoke could have been hired by any AD and Brandon just happened to be in the job at the time? Tue, Jul 24, 2012 : 6:09 a.m.
amen to that. Brandon is the best AD in the Big Ten and best at Michigan since Canham...that is a fact. Tue, Jul 24, 2012 : 2:39 a.m. It's interesting to see people defending this salary while still complaining that teachers and police officers making $50,000 a year are bankrupting the state. Tue, Jul 24, 2012 : 12:37 p.m.
How quickly we forget. Oh, yeah, we're demonizing success when we point out that some people are grossly overpaid for triviality and others, like teachers are derided and demonized when they want to EARN a decent wage. Tue, Jul 24, 2012 : 12:35 a.m.
Well Dave, maybe take some of that big fat raise and hire some nannies to keep an eye on your football team. 2 guys charged with felonies today, 8% of the team arrested since January. disgraceful. Tue, Jul 24, 2012 : 12:18 a.m.
Dave Brandon took a major pay cut to become AD at Michigan. People sometimes forget that. Tue, Jul 24, 2012 : 1:37 a.m. He's making up for it pretty quickly. Also, I think he'll give up some pay in order to be in the spotlight. Tue, Jul 24, 2012 : 12:56 a.m.
What do you consider a major pay cut? from 5 mill to a mere 1.5 plus incredible perks and benefits? He'll make far more in the long run from the business contacts he makes at UM and because he's in the &quot;public sector&quot; he won't be buffeted by the economic winds as much as a private sector millionaire exec. Tue, Jul 24, 2012 : 12:38 a.m. I never feel sorry for guys making $1.5 million a year. Call me old fashioned. Mon, Jul 23, 2012 : 10:51 p.m.
Because of his current pay and benefit range, he'll get 2-3 times that in his next exec job because &quot;he's worth it&quot; and we'll be told that &quot;that's what we have to pay to get top talent&quot;. Welcome to 1% merry go round. If you can't afford the price of the ride... sorry, you're on your own. Tue, Jul 24, 2012 : 6:10 a.m.
Mon, Jul 23, 2012 : 10:52 p.m.
Not to mention what his replacement will demand and get. Mon, Jul 23, 2012 : 10 p.m.
Let's remember that the Athletic Dept. is a private, for-profit corporation, albeit by another name. Aswith many other corporations, the CEO is well-compensated, while the hardest-working employees (called &quot;student-athletes&quot; in this case) are not paid their real worth. In that context, Mr. Brandon has raised the price to access the company's product, while maintaining strong demand, increasing revenue and the value of the brand. Yes, some among us who either can't or won't pay the premium he's asking will be left by the wayside, but it seems that others who will step up to the price are willing to take our places. This might be a cynical view, but I think it makes sense of where college athletics are today, and in that light, it makes good sense of Mr. Brandon's salary as well. Tue, Jul 24, 2012 : 4:01 a.m.
Would this then be another example of privatizing a public activity? - Only a few get the real dollars while the rest, including the players, are paid very little for their important contributions? Mon, Jul 23, 2012 : 10:46 p.m. If the Athletic Department is private for profit then they should be paying property taxes on all their property. Mon, Jul 23, 2012 : 9:17 p.m.
what an assinine waste of money on someone who puts the interests of the athletic department ahead of the interests of the University...highly inappropriate for the AD to be paid more than the President or Provost, they both need big raises. Tue, Jul 24, 2012 : 4:41 p.m. Yes, yes, to all of the others who bleed maize and blue because of long standing allegiance to UofM but are appalled by the incessant emphasis on money and big time sports. Mon, Jul 23, 2012 : 9:05 p.m. Does Dave Brandon deserve a raise? He has changed the culture here at U-M. I am struggling on what it means to be a fan. I had season tickets to the basketball games until this year when I was not able to get back into my section for lack of priority points. Is it because I am less of a Michigan fan? No, I did grow up in A2, go to Michigan, father was a professor here for 45 years, and have attended football games when you could get in free at halftime. I have not changed but Michigan has changed. They have brought in a culture that is all about money. If you have a lot of it and you can afford to give it to Michigan then you qualify to be a fan. I no longer qualify and I am really struggling with this new culture. This is Dave Brandon's new culture. Give him a raise? No, give him the boot and bring back the culture at Michigan where the only qualifying factor to being a Michigan fan was the desire to go out and support the team when they are bad and when they are good. We don't have to settle for the 1% taking over all that we love in life. Tue, Jul 24, 2012 : 1:36 a.m. It's all about Dave Brand. Mark my words, when he can't get his way anymore, he'll leave this place in a heartbeat. It's all about Dave brand. Mon, Jul 23, 2012 : 11:04 p.m. I used to watch UM play back in the late 60's - early 70's as well. Seats were general admission for $2. I also went to Basketball games before 1989 or the Fab 5. I've lived here my whole life but I can't donate enough to buy season tickets. I still love U of M and can't wait for Football season. I go to games now when tickets are offered to me and watch on tv otherwise. Money talks and the middle class is shrinking. It's depressing but it seems to be a sign of the times. Mon, Jul 23, 2012 : 9:37 p.m. I am with you here. But I have been dismissed by other commenters in the past for being an &quot;old blue hair (and I am not &quot;old&quot;)&quot;, and I have been told by others that Brandon is bringing Michigan up to the level of our competition. I think Brandon has done some things well, but his focus on promotion, on money, and on all the &quot;kitsch&quot; has cheapened the product and made it less appealing. When is our leadership going to say &quot;enough&quot;? I guess we got our answer today. Mon, Jul 23, 2012 : 9:24 p.m.
How will we measure how many people like Glenn write the UM out of their will because because they were offended when Brandon booted them out of their seats? The problem with using athletic money as a metric, is that he is only measuring the near term upside of money for the athletic department. The policy of kicking alumni out of their seats so each of the athletic &quot;donors&quot; can buy 8 seats in the basketball arena is constitutes fool's gold for the University.....undermining the long term interests of the University for short term gain. Donations for swimming pools and lacrosse stadiums will not make this University as great as donations to recruit and retain nobel prize winners. Mon, Jul 23, 2012 : 9:12 p.m.
You are speaking for a LOT of &quot;disenfranchised&quot; Michigan fans. You are applauded for your post. In spite of all of this Go Blue! Mon, Jul 23, 2012 : 9:02 p.m.
Can one of you wiser-than-I folk -- probably, most of you -- tell me what one can do with/needs a $1 million salary? Or $1.5 million salary? Or $1.8 million salary? Tue, Jul 24, 2012 : 2:58 p.m.
Well, his 6000 sq. ft mansion in barton hills overlooking the huron river has gotta cost some money to keep up. And several luxury cars. And exotic vacations with no expenses spared. And supporting his wife, two sons, and extended family. So yeah, he finds ways to spend it. Mon, Jul 23, 2012 : 7:50 p.m.
How much does Dave Brandon pull in in his role as Chairman of Dominos? How much Dominos stock does he have? Does he really need this money? Answers - 230,578 as of 2/23/12 - approximately $7.4 million. If you look back, he's exercised options of significant value, well over $30 million in the past few years. http://finance.yahoo.com/q/it?s=DPZ As Chairman of Dominos Board of Directors, he seems to make under $100k plus limited stock option grants. Mon, Jul 23, 2012 : 7:42 p.m. I guess none of the Tea Partiers or those who rail against big gubmint will criticize Brandon's hiring of a more than 100 new public employees and 30 new positions? I guess millionaire execs need huge staffs who for the most part don't make as much money and probably pay higher taxes than their boss because they can't afford slick tax accountants. Mon, Jul 23, 2012 : 10:02 p.m.
A well as the status quo-ers like you. Mon, Jul 23, 2012 : 8:47 p.m. Your diatribe has become quite tiresome. Mon, Jul 23, 2012 : 7:40 p.m.
Mon, Jul 23, 2012 : 8:03 p.m.
ANd of course MSC would say &quot;outstanding&quot;, as long as he is an ex-Regent and a major donor to the university. He sure has &quot;kitsched&quot; up the place, raised prices, and spent without limit. Mon, Jul 23, 2012 : 7:13 p.m.
Not bad for a kid from South Lyon! He's a local boy who made his own way, and I think he earns every cent they pay him. The U will profit greatly from his leadership of the athletic department, as it already has. Thanks, Dave! Mon, Jul 23, 2012 : 6:48 p.m.
At least he's working for his money, unlike those &quot;celebrities&quot; that are famous for nothing and yet earn $18 million a year. Mon, Jul 23, 2012 : 7:43 p.m.
Those celebrities of which you write are not public employees. Mon, Jul 23, 2012 : 6:43 p.m.
Is this where some of our &quot;donation&quot; money goes? Just wondering because if you do not &quot;give enough&quot; people lose their &quot;allocation&quot; for season tickets seat locations. In essence they go the highest bidder. If this is one of Mr. Brandon's ideas then it would seem appropriate he should get his raise. What a money generator he has created and the fans just love it. Mon, Jul 23, 2012 : 6:46 p.m.
and the fans are gullible, blind and literally &quot;buy&quot; into the notion that more money gets more performance. Mon, Jul 23, 2012 : 6:40 p.m.
Mon, Jul 23, 2012 : 10:48 p.m.
Mon, Jul 23, 2012 : 8:02 p.m. Didn't come for the money? Then why not take the job for less? And let the athletic department or university use it on other things? I am so concerned that he has carte blanche, because of his relationships as an ex-regent and as a big university donor. Just walked through the art museum yesterday and saw his name prominently displayed. Who in the world could say no to DB, given how prominent of a place DB has had as donor and regent? His only two bosses are essentially his buddies and his receipient of largesse. I don't like it and think it is inappropriate. It would be like making Al Taubman CEO of the medical center. Mon, Jul 23, 2012 : 6:47 p.m. So Domino's overpays their execs too? Who'da thunk it? Mon, Jul 23, 2012 : 6:37 p.m. Contrary to some of the negative posts above; I hope Dave Brandon stays. He's worth it. Am not 100% behind every decision he makes but these are times in which we live in. And what is my &quot;ilk&quot;? Is it anything like your &quot;ilk&quot;? Mr Brandon didn't get this far on his own. He had a lot of help from his other 1%ers. Mon, Jul 23, 2012 : 8:45 p.m.
Mixmaster, get over it. The man is educated, is in a responsible position and is successful. Why do you, and your ilk, demonize success? Mon, Jul 23, 2012 : 6:45 p.m.
Yeah, these times where the rich get richer and the poor get poorer. Greed among the 1% is still greed. Mon, Jul 23, 2012 : 6:13 p.m.
Holy crap! Thats a lot of money. Mon, Jul 23, 2012 : 8:25 p.m.
Not according to the 1%. Just pocket change. Mon, Jul 23, 2012 : 5:54 p.m.
Mon, Jul 23, 2012 : 5:38 p.m. Overpaying execs with big personal staffs to do their work must stop. Mon, Jul 23, 2012 : 5:13 p.m. Seems everyday I read a story about how the almighty U of M is spending yet more millions on one thing or another! I'm just curious...can anyone tell me when/where was the last time they (U of M) spent millions in the community that their swallowing up? Tue, Jul 24, 2012 : 2:48 a.m.
Mon, Jul 23, 2012 : 6:12 p.m.
Mon, Jul 23, 2012 : 5:35 p.m. Without U-M, no rich culture, scholastic community, or economic success as we know it in this town. Mon, Jul 23, 2012 : 5:22 p.m. Yes, UM does nothing for its community but provide tens of thousands of jobs and a stable business atmosphere, no matter how the economy is doing.